You get the picture. It’s fun and exciting to see the new developments of the modern world. 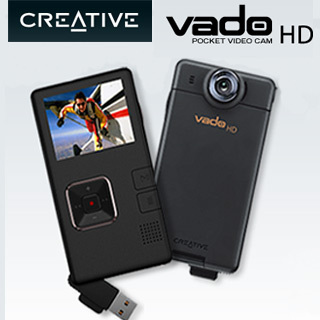 I recently bought a Creative Labs Vado HD pocket camera. This is probably my favorite toy of all time. It’s smaller than my cell phone and takes up to 4 hours of HD+ quality video. Soon, I’ll have the iPod Touch, and believe me, it’s more about my monetary situation than my desire for it that’s kept me from already possessing this awesome tool. And I can guarantee that one day, if and when I become rich, I will be spending a majority of my money at Best Buy or Amazon.com on the newest and coolest pieces of technology. Now we come back to my original question. Some people seem to be afraid, stubborn, or just generally apathetic towards the newest pieces of technology out there. And this is completely understandable if you’re the kind of person that doesn’t own a TV and just likes to “live off the land” essentially. I get that, that’s completely OK. But what I don’t get is when people just genuinely don’t want to try the newest thing out there. They love watching television and movies, but still use a VCR and “rabbit ears”. They love capturing family videos but still want to use that over-the-shoulder clunker to get their low-quality film. These things will literally make life so much easier and better quality. I don’t have an answer for it, probably because I have a very skewed view. As I have basically already spelled out, I’m a tech-junkie. And the gap between tech-savvy and uninterested is growing at a faster pace than ever because of the amazing new gadgets that are being produced at an exponential rate these days.